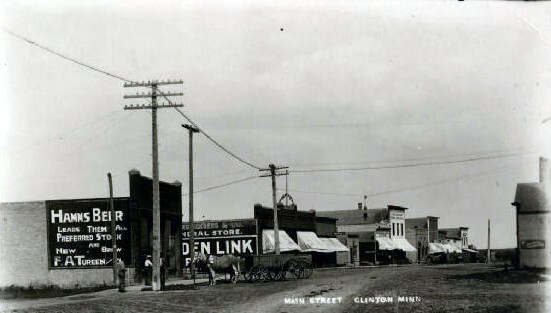 The village of Clinton was platted in 1885. It was incorporated on August 22, 1890. Peter McCormick opened the first store in Clinton. It was in a building that J. M. Finney built at the corner of Main and First Street and was the office of the Clinton Advocate when it was destroyed in the 1908 tornado. The first general store was also the post office and a lumber yard. J. C. Jasperson also built a general store. Olaf Erickson and A. E. Anderson built the Clinton Milling Co. in 1898. The National and Monarch were the first two elevators built. There were three shown along the tracks in 1899, and at one time, there were six elevators in Clinton. Two of the Farmer’s Cooperative elevators were moved to the Alan Larson farm northeast of Clinton in March of 1979. Three remained along the abandoned track in 1981, all the property of the Farmer’s Cooperative Elevator Co. Dr. I.C.J. Wiig built the Samaritan hospital in 1897 on the northwest corner of Main and First Streets, about a block west of the railroad tracks. It burned in the early 1900s and was not replaced. J. N. Barton built the first residence in Clinton. The house at 325 Lake Street was the home of Alvin Steen in 1981. J. N. Barton also built the first saloon in Clinton and the first brick building in 1897. There were two hotels on Main Street just west of the depot before 1900. William Burt Barton bought the one on the north side of the street from J.P. Roach, and later bought the one on the south side of the street from the Black family. That Barton Hotel was the combination of two buildings, the east half built by Henry Petrick in 1888. The Barton Hotel was torn down in 1970 and replaced by a trailer court. Members of the Campbell-Williams American Legion Post dedicated the Veteran’s Memorial Building on June 19, 1954. A community fund drive provided the money for the $70,000 building construction in 1953-54 by Johnson Brothers of Beardsley. Larson Sheet Metal of Clinton installed the plumbing and heating. The building has been a busy community center!